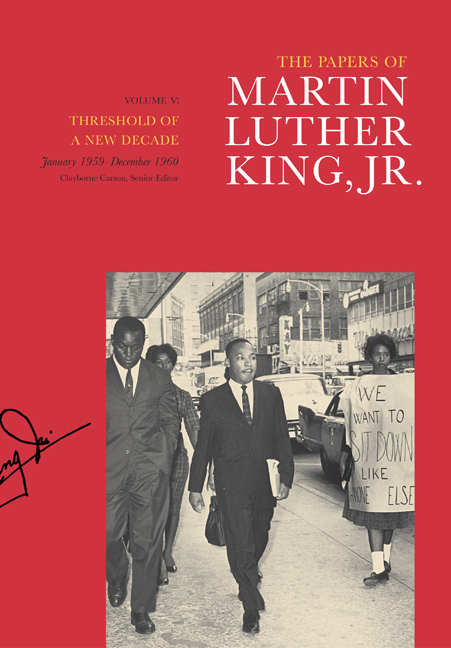 The Papers of Martin Luther King, Jr. has become the definitive record of the most significant correspondence, sermons, speeches, published writings, and unpublished manuscripts of one of America's best-known advocates for peace and justice. Threshold of a New Decade, Volume V of the planned fourteen-volume series, illustrates the growing sophistication and effectiveness of King and the organizations he led while providing an unparalleled look into the surprising emergence of the sit-in protests that sparked the social struggles of the 1960s. During this pivotal period of his career, King traveled to India in early 1959 to meet with Prime Minister Nehru and other associates of Mahatma Gandhi. After returning to Montgomery, King confronted the continuing ineffectiveness of his Southern Christian Leadership Conference (SCLC) by demanding personnel changes and agreeing to relocate to Atlanta at the beginning of 1960. King's move took place just before African American students in the South reclaimed the energy of the Montgomery bus boycott with their bold sit-in protests, which King predicted would become "an integral part of the history which is reshaping the world, replacing a dying order with modern democracy." He was arrested in October after participating in a sit-in protest in Atlanta. His resulting imprisonment led presidential candidate John F. Kennedy to phone his sympathies to King's wife, Coretta, a move many credit for providing the margin of victory in the close election of 1960. Clayborne Carson is Director and Senior Editor of the Martin Luther King, Jr., Papers Project and Professor of History at Stanford University. Tenisha Armstrong, Associate Editor, is a graduate of the University of California, Santa Cruz. A former King research fellow, she joined the Project staff in 1998. Susan Carson, Managing Editor, holds an M.L.S. from San Jose State University. She joined the Martin Luther King, Jr., Papers Project in 1987 and is a coeditor of Volumes III and IV. Adrienne Clay is a graduate of Colby College and a coeditor of Volume IV. Kieran Taylor, Contributing Editor, is a Ph.D. candidate at the University of North Carolina at Chapel Hill and coeditor of Volume IV.